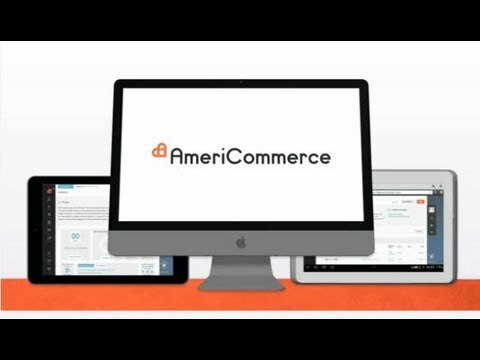 AmeriCommerce is a cloud-based eCommerce platform built for high volume online stores and complex products. Within one dashboard, users can share all of their products, orders, gateways, shipping methods, discounts, inventory and entire catalog across thousands of online stores. AmeriCommerce also allows users to define their own rules and methods when managing discounts, emails, shipping, and taxes. The AmeriCommerce platform supports a range of features including multi-store management, B2B/wholesale capabilities, marketing tools, headless/remote carting, subscription products, and more. AmeriCommerce enables users to sell their products via any site, blog or marketplace using embedded ecommerce tools and different apps and add-ons with popular marketplaces like Amazon, eBay, Facebook, Google, and more. Mobile and responsive design functionality ensures users can sell products from any mobile device or smartphone. Multi-faceted pricing options and product variants allow users to set customer-based or tiered pricing, as well as compare products against each other and build distinct groups, kits or boxes. AmeriCommerce also supports product reviews along with up-selling tools such as product lists of ‘top sellers’, ‘suggested items’ and ‘related items’. AmeriCommerce facilitates multiple payment types, allowing customers to make split or partial payments, or pay using a gift card or using customer loyalty points. Customers have access to a variety of payment options, from major credit cards and purchase orders to PayPal, Amazon Checkout, and more. AmeriCommerce integrates with over 50 different payment gateways including Stripe, Authorize.Net and WorldPay and supports a range of shipping capabilities such as live shipping rates, custom shipping methods, shipping integrations, shipping taxation, and more. Other AmeriCommerce features include PCI certification, DDOS mitigation and protection, custom behavior triggers, automated notifications and SEO control. AmeriCommerce allows us to deliver a great experience for our customers. The ability to customize this platform with reasonable development times allows us to concentrate on our own product development rather than programming. It's easy to manage large data sets, make daily site updates and fulfill orders. It's mobile friendly themes, top-notch security and fast servers make it a great option for those companies just starting out and those that need just a little extra care.The platform is constantly improving, rolling out new features monthly at no additional cost to their customers. We have grown from a basic subscription plan to a platinum custom plan that meets and exceeds our customer demands. We attribute much of our growth to their ability to customize the platform to meet our needs. We offer products with hundreds of variations and need to serve up that information in digestible formats for our customers and with their developer's help we have grown 300% year over year for the past three years. Not a small feat for a mature site! The platform is constantly improving, rolling out new features monthly at no additional cost to their customers. We have grown from a basic subscription plan to a platinum custom plan that meets and exceeds our customer demands. We attribute much of our growth to their ability to customize the platform to meet our needs. We offer products with hundreds of variations and need to serve up that information in digestible formats for our customers and with their developer's help we have grown 300% year over year for the past three years. Not a small feat for a mature site! We really have not had too many issues with their service or platform that could not be addressed in a timely fashion. The only issue we have had in the past year was a single instance of excessive downtime, greater than 24 hours. This has only happened once in a decade of service. A long time ago, I created a website for this company from pure html and css. The orders were processed via a simple email script that would send the order to the office to be charged and filled. For the time, it was effective and made the company a lot of money. Unfortunately the owner of the server passed without leaving the sign in information and the company was stuck. I did research and found AmeriCommerce and it is so much better as well as less wear and tear on yours truly. I don't have to focus on code any longer. Furthermore the built in ability to sell digital products has taken this company into the future of publishing through the internet.I like the huge array of features available but most of all the support and customer service is the best. The team is responsive as well as forgiving and understanding of my own errors. I like the huge array of features available but most of all the support and customer service is the best. The team is responsive as well as forgiving and understanding of my own errors. It's not about the software so much as the documentation. I cannot always find the instructions that I need to implement a feature and sometimes it is old. When I started out, it was kind of a nightmare wading through everything. Now that I have seen it all, I can usually remember on my own or sometimes ask for a hint from a customer support person. I'm not sure that an online manual, instead of just a searchable support system of articles would help sell the product but it might. Happy happy happy.I have been with Americommerce for almost 10 years. I started out a complete novice with no idea of making my website a business as circumstances changed I needed to up the game and my website became the source of income for my family. We have been able to grow and thrive with Americommerce. We have changed our site, changed products lines and always been able to adapt within the Americommerce system. I looked at other services and found out what a phenomenal value I was getting at Americommerce. Other shopping carts have everything a la cart ie. templates, design services, shipping integration so you end up paying MUCH more. Also, Americommerce has their own templates so they can build, change and correct issues. Other services do not have that. You have to buy a template that is not supported by an in house team like Americommerce can do. Enjoying my Americommerce experience and highly recommend it. I have been with Americommerce for almost 10 years. I started out a complete novice with no idea of making my website a business as circumstances changed I needed to up the game and my website became the source of income for my family. We have been able to grow and thrive with Americommerce. We have changed our site, changed products lines and always been able to adapt within the Americommerce system. I looked at other services and found out what a phenomenal value I was getting at Americommerce. Other shopping carts have everything a la cart ie. templates, design services, shipping integration so you end up paying MUCH more. Also, Americommerce has their own templates so they can build, change and correct issues. Other services do not have that. You have to buy a template that is not supported by an in house team like Americommerce can do. Enjoying my Americommerce experience and highly recommend it. Over the 10 years I am with Americommerce I have not had any negative issue that was significant or couldn't be easily resolved. I'm very pleased with the service AmeriCommerce has provided. I really like that their site is approachable by people of all tech skill levels. Their customer support is outstanding as well.AmeriCommerce caters to a wide variety of users. If you have no coding background at all using one of their many templates might be for you. However if you are savvy with code and want to add customized features, you have a great deal of access to do so. AmeriCommerce caters to a wide variety of users. If you have no coding background at all using one of their many templates might be for you. However if you are savvy with code and want to add customized features, you have a great deal of access to do so. There is a steep learning curve when you originally begin using AmeriCommerce and it's not always intuitive but their support is often helpful when you need to find something. One feature I wish could be added to the site is for there to be an option for adding items to your cart and instead of being redirected somewhere, you simply receive a notification saying the item was added. Sell products on any site, blog or marketplace with AmeriCommerce’s embedded ecommerce tools and apps and add-ons with popular marketplaces like Amazon, eBay, Facebook, and more. Multiple payment types and options allow customers to make split or partial payments using any major credit card or 1 of AmeriCommerce’s 50 integrated payment gateways, including PayPal. Shipping integrations enable users to synchronize any order, shipment and customer data with popular shipping management solutions like ShipWorks, AfterShip, ShippingEasy and ShipHero. AmeriCommerce supports wholesale and B2B eCommerce tools such as advanced pricing, bulk or price quantity breaks, distribution options, multiple customer types, a workflow rule engine, and more. Multi-store management capabilities enable users to manage the customers, orders, products, shopping and transactions of multiple stores through a single platform. Below are some frequently asked questions for AmeriCommerce. Q. What type of pricing plans does AmeriCommerce offer? Q. Who are the typical users of AmeriCommerce? Q. What languages does AmeriCommerce support? Q. Does AmeriCommerce support mobile devices? Q. Does AmeriCommerce offer an API? Yes, AmeriCommerce has an API available for use. Q. What other apps does AmeriCommerce integrate with? Q. What level of support does AmeriCommerce offer?